The Romans gave this month the Latin name Aprilis, from the verb aperire, "to open", in allusion to its being the season when trees and flowers begin to "open", which is supported by comparison with the modern Greek use of άνοιξη (ánixi; opening) for spring. Though it is spring in the Northern Hemisphere, in the Southern Hemisphere it is autumn. April was the second month of the earliest Roman calendar, before Ianuarius and Februarius were added by King Numa Pompilius about 700 BC. It became the fourth month of the calendar year (the year when twelve months are displayed in order) during the time of the decemvirs about 450 BC, when it also was given 29 days. The 30th day was added during the reform of the calendar undertaken by Julius Caesar in the mid-40s BC, which produced the Julian calendar. It is likewise the fourth month in the Gregorian calendar. In the Orthodox Church, the month of April is a month primarily dedicated to the moveable instead of the immovable ecclesiastical calendar. 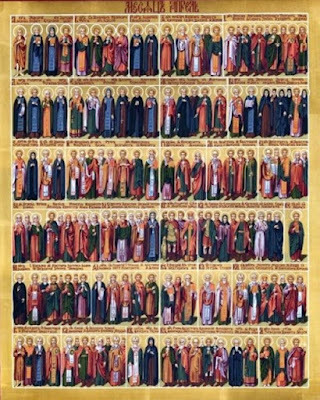 Though the Church commemorates many saints on a daily basis throughout the month of April on its immovable calendar, as it does every month, you will not find many of the more popular names during this month. Those few saints who are popular, usually have their immovable feast transferred to the moveable calendar. For example, St. Mary of Egypt (Apr. 1) and St. Savvas of Kalymnos (Apr. 7) are transferred to the Fifth Sunday of Great Lent, while St. George the Great Martyr (Apr. 23) and St. Mark the Apostle (Apr. 25), if their feasts fall within the period of Great Lent or Holy Week, will have their feasts transferred to the Tuesday after Easter, or Bright Tuesday. Bright Week especially commemorates many saints and feasts in its movable calendar that would have possibly fallen during Great Lent and Holy Week. The Church has done this by design, to avoid any celebrations during the weekdays of Great Lent or Holy Week, and keep us focused on the solemn movable feasts and commemorations and services. Since Orthodox Easter can fall between April 4th and May 8th, the month of April is not necessarily a month of the Resurrection of Christ, but it is the month most likely and most often to celebrate it. This being the case, it is the month in which Holy Week most often falls as well, and Great Lent is coming towards its conclusion. And with Easter Sunday behind us, we begin the period known as the Pentecostarion, where the movable calendar leads us towards Pentecost, fifty days after Easter. The week beginning with Easter Sunday is known as Bright Week. These events are the most probable focus for Orthodox Christians during the month of April, or at least their anticipation. With this being said, the month of April is primarily focused on the movable calendar, and in this month there will either be great anticipation or great joy or both. This makes it one of the most significant months in the Orthodox calendar. 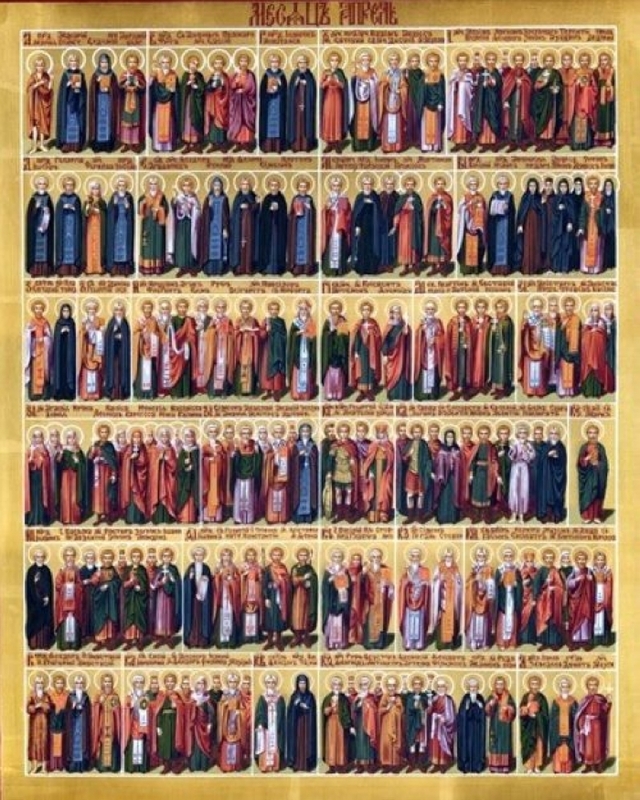 Despite the focus on the movable calendar, however, it is also an excellent time to become familiar with the daily saints still on the immovable calendar commemorated in the month of April that are not so popular, yet are no less significant than the popular ones. This will only serve towards our greater daily spiritual benefit in the month of April.